NECKLACE - SARAH COVENTRY. "PLAIN AND FANCY" FROM 1958. 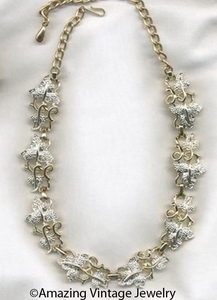 TEXTURED SILVERTONE LINKS OF LEAVES WITH GOLDTONE ACCENTS. ADJUSTABLE UP TO 17" LONG, 3/4" WIDE. VERY GOOD CONDITION WITH SOME HARD TO SEE WEAR TO SOME OF THE RAISED AREAS ON SOME OF THE LINKS. CHAIN IS ALSO BRASSIER THAN THE GOLDTONE IN THE NECKLACE.